Finally the answer – Why do Christians believe in prayer? In science, you have to keep track of the misses as well as the hits. And that is probably the key lesson in my short talk here. This is how psychics works, astrologers, tarot card readers and so on. People remember the hits and forget the misses. In science we have to keep track of the whole database and look to see if the number of hits stands out from the total number that you would expect by chance. This is why Christians believe in prayer. If Christians would track the misses as well as the hits, they would immediately see that prayer is a superstition. Or Christians can try this simple test: Pray to heal an amputee. The reader who posed the question offers the first definition. – believes and accepts the death, burial and resurrection of the Lord Jesus as the Gospel. – knows that we are not our own, we were bought with a price to glorify God in our body and spirit, and cannot be the servants of men (First Corinthians 6 19-20; 7: 23). – lives for Christ. I am nothing; realize that we are 6 zeros with Christ before us making us a million, and are willing to die for Him. – knows that Christ is the Creator (Colossians 1:16; Isaiah 44: 24). – believes in a triune God â€” salvation planned by the Father, Implanted by the Son, Empowered by the Holy Ghost. – looks forward to walk on the Street of Gold and enter in through the Gates into the City of Heaven (Revelation 21:21; 22:14). – all Evangelicals are Protestants, but not all Protestants are Evangelicals. – speaking in tongues is characteristic of Pentecostals only. – Evangelicals are the most conservative and fundamentalist of Protestant Christians. – Evangelicals have the most difficulty with interfaith dialogue and are definitely not going to embrace my definition that all religions are like different paths up the same mountain. The most interesting part of the “God Squad” article is the last sentence: “I know The Boss will sort it all out when the Messiah comes (or comes again). In the meantime, I keep telling them that if being Jewish was good enough for Jesus, itâ€™s definitely good enough for me!” Of course if you believe in “The Boss”, you also believe that he will cast anyone who is incorrect into the eternal torture of Hell after he “sorts it all out”. 10 – You vigorously deny the existence of thousands of gods claimed by other religions, but feel outraged when someone denies the existence of your god. 9 – You feel insulted and “dehumanized” when scientists say that people evolved from lesser life forms, but you have no problem with the Biblical claim that we were created from dirt. 8 – You laugh at polytheists, but you have no problem believing in a Trinity god. 7 – Your face turns purple when you hear of the “atrocities” attributed to Allah, but you don’t even flinch when hearing about how God/Jehovah slaughtered all the babies of Egypt in “Exodus” and ordered the elimination of entire ethnic groups in “Joshua” — including women, children, and trees! 5 – You are willing to spend your life looking for little loop-holes in the scientifically established age of the Earth (4.55 billion years), but you find nothing wrong with believing dates recorded by pre-historic tribesmen sitting in their tents and guessing that the Earth is a couple of generations old. 4 – You believe that the entire population of this planet with the exception of those who share your beliefs — though excluding those in all rival sects — will spend Eternity in an infinite Hell of Suffering. And yet you consider your religion the most “tolerant” and “loving”. 3 – While modern science, history, geology, biology, and physics have failed to convince you otherwise, some idiot rolling around on the floor speaking in “tongues” may be all the evidence you need to prove Christianity. 1 – You actually know a lot less than many Atheists and Agnostics do about the Bible, Christianity, and church history — but still call yourself a Christian. At issue is the creation by our General Assembly of a Christian license plate, featuring a bright-yellow cross superimposed on a church stained glass window and bearing the words “I Believe.” Our state government is clearly giving preferential treatment to a particular religion. The legislature is not creating a license plate for Jews, Muslims, Hindus, Buddhists or pagans. Atheists, agnostics and humanists cannot order an “I Don’t Believe” plate. While Congress was debating what to do with the Wall Street bailouts this week, they took the time to vote on one other piece of legislation dealing with money. Amidst the largest financial crisis in our nationâ€™s history, our senators unanimously passed a bill yesterday supporting an organization that discriminates against atheists and gays. “The reaction on the blog was vitriolic when I quoted reports in the mainstream American media, including the New York Times, about Palin as governor pursuing vendettas, firing officials who crossed her and sometimes blurring the line between government and personal grievance. When I asked if this would be the behaviour of a Christian, one emailer responded: “You are a sad little pathetic man who does not have a shred of decency and cannot support his beliefs with the truth, so must make up ‘facts.’ Someday you will be judged for this, and I hope that day comes soon. You deserve what you get.” Imagine what will happen to rational people if Palin actually gets elected. Americans know that politicizing our churches is terrible thing to do. It will divide our communities along religious lines, undercutting our secular and pluralistic democracy. If elections boil down to which churches can turn out the most voters from their own pews, the majority faiths will control the government and church-state separation and interfaith peace are sure to fall by the wayside. “The proposed regulation completely obliterates the rights of patients to legal and medically necessary health care services in favor of a single-minded focus on protecting a health care provider’s right to claim a personal moral or religious belief,” the attorneys general said in a letter to the Department of Health and Human Services. 1) Honest question: Why do you believe in god? 2) Given the almost certainty of God’s existence, why does anyone not want to believe? Which are the most and least compelling to you? What doesn’t she know about financial markets, Islam, the history of the Middle East, the cold war, modern weapons systems, medical research, environmental science or emerging technology? Her relative ignorance is guaranteed on these fronts and most others, not because she was put on the spot, or got nervous, or just happened to miss the newspaper on any given morning. Sarah Palin’s ignorance is guaranteed because of how she has spent the past 44 years on earth. April: When I told you I found something much more meaningful than sports, that was an example of a transitional statement. It’s a way to delicately turn the conversation from something worldly to something spiritual. Kristi: Yeah but my friends are so not into this. April: I know, they’re always talking about drinking, sexual stuff. April: Well do you care about them? April: Witnessing to your friends isn’t easy, but neither is getting nailed to a wooden cross. Jesus paid for your sins with his blood. Kristi, you have to take the initiative to share Christ. Just like the apostles did, and if you don’t, who will? April: When you witness, you can feel his power come over you. You’ve felt his power, haven’t you Kristi? April: Well then you can do it. Be courageous. And remember, God is always with you. Kristi: Oh, gotta jam, practice. April: And I will see you in youth group, right? In this view of the universe, you “yield to Christ” and Christ in turn “directs your life” so that everything you do is part of “God’s Plan”. You become God’s puppet. Why would you want to “yield to Christ”? Because, according to the film, “God LOVES you and offers a wonderful PLAN for your life.” This is “The Master Plan”. This analogy has been used before, but it bears repeating. Today, on planet earth, 30,000 kids will die of starvation, dehydration, etc. So today let’s imagine that they pray this prayer: â€œDear God, please show me your wonderful PLAN for my life” The answer from God will be, â€œWell, 30,000 kids, my PLAN is for you to die of starvation today! Have fun!â€ Then all 30,000 kids die. And then we repeat that same process EVERY SINGLE DAY. That is not a wonderful plan – it is a disaster. – One in three Americans will suffer from cancer, and 500,000 will die from cancer this year. That is not a “wonderful plan” – it is a disaster. – 650,000 Americans will die of heart disease this year. That is not a “wonderful plan” – it is a disaster. And if God is the “intelligent designer” of the human body, it shows that God has no idea what he is doing. – More than 100,000 Americans will die in accidents this year. 13,000 of them will die because of drunk drivers. 30,000 of them will die from gunfire. That is not a “wonderful plan” – it is a disaster. To believe in a “wonderful God” and his “wonderful plan” in the face of such obvious counter-evidence is at least ridiculous, possibly insane. If, in the transcript above, April “feels his power”, that would be a hallucination worthy of a visit to the therapist. The only way for Christians to believe in God is to completely ignore reality. They have to ignore all of the facts, and the lack of a “wonderful plan”, as shown above. They have to ignore the complete lack of evidence for God. They have to ignore the fact that prayer is a superstition. They must ignore all of the ridiculous garbage in the Bible. Et Cetera. What is happening, I think, is this: religious prejudice is becoming a proxy for racial prejudice. In public at least, itâ€™s not acceptable to express reservations about a candidateâ€™s skin color, so discomfort about race is sublimated into concerns about whether Mr. Obama is sufficiently Christian. The result is this campaign to â€œotherizeâ€ Mr. Obama. Nobody needs to point out that he is black, but thereâ€™s a persistent effort to exaggerate other differences, to de-Americanize him. Raising doubts about a candidate based on the religion of his grandfather is toxic and profoundly un-American, cracking the melting pot we emerged from. Someday people will look back at the innuendoes about Mr. Obama with the same disgust with which we regard the smears of Al Smith as a Catholic candidate in 1928. Christianity, in other words, is a socially acceptable crucible of prejudice. Christianity by definition is religious prejudice. Here we see Christianity as a platform for racial prejudice as well. And we have already discussed Christianity’s endemic sexual prejudice. Christianity gives people who enjoy discrimination and prejudice a socially acceptable way to partake of their prejudice every day. – All oil and coal come from the “great flood” 4,000 years ago. – Cro-Magnon Man and Neanderthal Man were “Created at the same time as man.” Killed in the flood or through other causes. – Within the last 6,000 years there was a single “ice epoch”. (Meaning that the ice cores from Antarctica that go back tens of thousands of years must be fake). – The great flood and the ice epoch carved the Grand Canyon. It is only 4,000 years old. – The great flood lasted, “40, 150, 253, 314 or 370 days” (the Bible is unclear), occurred 4,400 years ago, and God then “hasted away” the water that covered all the mountains on earth. Strangely, these flood waters did not touch many parts of the earth, because there is no evidence of a flood. Also interesting: “The Arc contained eight people, from whom we are all descended. It also contained two of each kind of animal.” All people and civilizations on earth apparently descended from the 8 people on the ark, including the Chinese, the Aztecs, the American Indians, Africans and the Europeans. Yet there is no DNA evidence of such. – Evolution is wrong: “Living species were obviously not created through an evolutionary process, every surviving land-based mammal species (about 5,400) had both ancestors on the Arc.” No DNA evidence of this either, since it would lead to massive inbreeding and disease. Is this article a huge piece of satire? Or does Ebert, like tens of millions of Americans (60% of American adults according to polls), actually believe this? In order to believe it, he must also believe that millions of scientists and dozens of scientific disciplines are completely wrong on a thousand fronts. All fossil dating is wrong. All astronomers and astrophysicists are wrong about the age of the universe. Biologists are wrong about DNA. Earth scientists are wrong when they date things like Mt. Everest, the Grand Canyon, and the ice sheets. Scientists studying the age of the human species and its spread around the world are wrong. Any scientist with evidence about evolution is wrong. Et Cetera. How can anyone believe this nonsense? If scientists are deluded and wrong in so many ways, how can they possibly create things like the Large Hadron Collider? God gave us the Bible for many reasons, but one of the most important is to tell us the truth — about God, about Jesus Christ, about ourselves, about how God wants us to live, even about the future. Don’t feel like you have to master everything all at once. But set aside a few minutes and read a brief portion every day — just a paragraph or two at first. This seems like an excellent suggestion. Here at WWGHA, we would like to help Mrs. J.Z. and other Christians by pointing out several interesting Bible selections. This makes things so simple: Ask any Christian leader, like Dr. Graham for example, to drink a bottle of Drano. If Dr. Graham won’t drink the Drano, it means he is not a believer, and therefore can be ignored. Of course this means that there are no believers – all Christians in the world today are frauds according to Jesus. They can’t drink poison. Anyone with common sense who reads this would realize that Jesus is an unbelievable jerk: “This statement is totally ridiculous on several different levels. First, something like a hand cannot “cause you to sin” — your brain causes “sin.” Every intelligent person knows that. Therefore, gouging your eye out or cutting your hand off is useless. If you have a problem with “sin” and you are going to amputate something to solve it, you would need to amputate your brain, since that is where all “sin” originates. In this section we learn that God is an insane demon, willing to murder millions of people (and animals) because He made a mistake. Anyone with common sense would immediately understand that the Bible is a book of myth (since this flood never happened), and that the mythology surrounding “God” portrays him to be a lunatic, violent beyond belief, unable to control his emotions, and a bumbling fool. There are many other sections like this. Anyone with common sense who reads these passages would again see that “God” is an insane lunatic. Surely God would find more creative and compassionate solutions to these problems besides murder. Or God, being “all-powerful,” would kill the offenders himself if He were real. If you are a Christian, please read the Bible. Anyone who has common sense can see that the Bible, and the religion it supposedly portrays, are ridiculous travesties worthy of quick dismissal. Under this view of the universe, we have an insane demon in heaven who “plans” hurricanes, “plans” to kill tens of millions of children every year through starvation, dehydration and disease, et cetera. Being all-powerful and able to stop these tragedies, God instead chooses to plan these things. He planned for hundreds of thousands of people to lose their homes in Hurricane Ike. The alternative view of the universe is rational thinking. 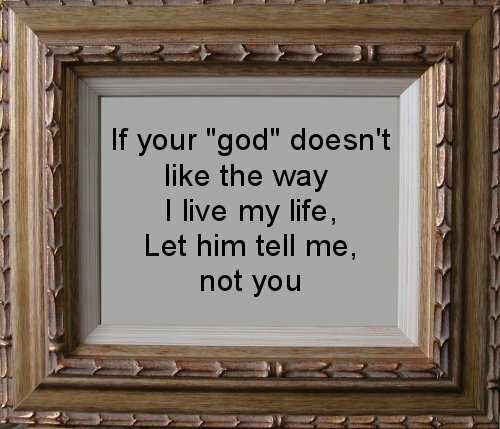 In this interpretation, there is no God. Instead, good and bad stuff happens to people regularly. There are hurricanes, yes. There are reasons why hurricanes form and track the way they do. If you look at things through the eyes of statistical analysis, this is the interpretation that is true. But you reach the same conclusion if you use common sense. Why would anyone want to believe in an insane demon in the sky who plans hurricanes and all their destruction? Imagine a giant American corporation with tens of thousands of employees. It also has tens of thousands of franchises all over the country. Now imagine that this corporation actively discourages women from being managers. What do you think would happen to a corporation like that? If there were a normal corporation, it would be severely punished. At issue is a magazine cover that features five female pastors. The magazine was pulled off the shelves. Why? The group says women pastors go against its beliefs, according to its interpretation of the New Testament. The magazine was taken off stands in more than 100 Lifeway Christian Bookstores across the country. 1) The U.S. government, which would punish any normal organization that behaved this way, turns a blind eye to this obvious case of discrimination. 2) The church has tens of millions of female members who, apparently, have been forced or brainwashed into silence. Any rational person is once again left dumbfounded at the hypocrisy and backwardness of religion, and is stunned by the way the government ignores this obvious case of discrimination. â€œBut I tell you who hear me: Love your enemies, do good to those who hate you,  bless those who curse you, pray for those who mistreat you. If someone strikes you on one cheek, turn to him the other also. If someone takes your cloak, do not stop him from taking your tunic. Give to everyone who asks you, and if anyone takes what belongs to you, do not demand it back. Do to others as you would have them do to you. â€œIf you love those who love you, what credit is that to you? Even â€™sinnersâ€™ love those who love them. And if you do good to those who are good to you, what credit is that to you? Even â€™sinnersâ€™ do that. And if you lend to those from whom you expect repayment, what credit is that to you? Even â€™sinnersâ€™ lend to â€™sinners,â€™ expecting to be repaid in full. But love your enemies, do good to them, and lend to them without expecting to get anything back. Then your reward will be great, and you will be sons of the Most High, because he is kind to the ungrateful and wicked. Be merciful, just as your Father is merciful. Jesus’s message is simple enough: Love your enemies. Yet Baptists support Bush (who started the war in Iraq), McCain (who sings “Bomb, Bomb, Bomb; Bomb, Bomb Iran”) and Palin (who is ready to go to war with Russia). The level of hypocrisy is astounding.